When big names come together for a film, it is sure to create a magic that will last. 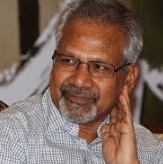 Post Kadal, Maniratnam's film OK Kanmani is seen as a unique romantic drama. As reported earlier the film's shooting started in the month of October and is set to be wrapped soon. Further, close sources from this film revealed that the title 'OK Kanmani' stands for 'Oh Kaadhal Kanmani'. This film starring Dulquer Salmaan, Nithya Menen and Prakash Raj in the lead roles is produced by Maniratnam's home production Madras Talkies. Also the music composed by AR Rahman is supposedly releasing by next month. Along with the renowned cinematographer PC Sreeram, Mani is out to give a treat to his audience with yet another bi-lingual love story (Malayalam and Tamil). AR Rahman's Act Reconfirms His Humility! Junior AR Rahman - Ameen, To Make His Tamil Debut With Mani Ratnam ? After AR Rahman, Anirudh Gets Ticked Aka Verified ! People looking for online information on AR Rahman, Dulquer salmaan, Oh Kaadhal Kanmani, OK Kanmani will find this news story useful.